(FNA)- Syrian army soldiers repelled terrorists’ massive attack on their positions in Damascus after hours of clashes, inflicting major losses on them. The ISIL terrorists’ large-scale attack to capture the government forces’ positions in Eastern Ghouta was fended off by the strong defense of the Syrian military men. Meantime, the Syrian army and popular forces continued their military advances in other parts of Syria, including Aleppo and Raqqa, over the past 24 hours. Syrian Army troops repelled Jeish al-Islam’s offensive on their positions in Eastern Ghouta and then in a rapid counterattack pushed the militants back from the battlefield, capturing the Air Defense Battalion Base to the Northeast of Damascus city. The army men fended off Jeish al-Islam’s attack on their strongholds in Eastern Ghouta, killing and wounding a number of militants near the Air Defense Battalion Base. Then, the army troops launched a powerful counterattack on the militants’ lines, targeting the farms and military base Northeast of the militant-held town of Hazrama. The army’s rapid counterattack resulted in the capture of the Air Defense Base in Hazrama’s Northeastern outskirts. Syrian Army troops and popular forces are getting ready to carry out a fresh round of offensives to liberate the territories that are still under the control of ISIL and Jeish al-Fatah in different parts of Aleppo province, a military source disclosed on Tuesday. The source said that the pro-government forces that recently liberated the Eastern neighborhoods of Aleppo city are about to launch large-scale offensives against ISIL positions in Eastern and Northeastern Aleppo and Jeish al-Fatah positions in Southern and Southwestern Aleppo. The sources added that liberation of the Eastern districts of Aleppo was a great victory, but anti-terrorism battles in Aleppo province are still underway. Based on reports, the Syrian military forces are about to start an operation from the Northern direction to free the towns of Deir Hafer and al-Bab, while other units will kick off their operation from the South to take back the districts of Rashedeen 4 and 5 and then Khan Touman. The Kurdish-led Syrian Democratic Forces (SDF) have driven ISIL out of 110 villages in the course of the Euphrates Rage Operation in Raqqa province since November 5, the Kurdish sources disclosed Tuesday. The SDF in its latest statement announced that the Kurdish fighters have taken control of 110 villages, tens of farms and key hills in the Euphrates Rage Operation since November 5th, while ISIL has suffered 277 casualties in the operation. The SDF also advanced significantly against ISIL in the second phase of its Raqqa operation. The ISIL terrorist group suffered a heavy death toll and its military hardware sustained major damage after its attack on government positions in Eastern Homs was warded off by the Syrian Army troops. Terrorists targeted several masts of power lines in Southwestern Damascus, cutting off transmission of electricity to Quneitra province in Southern Syria. Terrorist groups affiliated to Fatah al-Sham Front (previously known as the al-Nusra Front) detonated the power transmission masts to Quneitra province in al-Khazrajiyeh region in Western Ghouta. A source in Quneitra province said that the terrorists detonated the bombes in three major transmission masts of electricity lines in al-Khazrajiyeh. In the meantime, terrorist groups deployed in Sa’asa’a prevented maintenance units to repair a high voltage electricity mast in Quneitra that was destroyed by militants a couple of days ago. Syrian Army troops and Air Force targeted ISIL’s positions and the concentration centers of other militant groups that had breached the newly-brokered ceasefire in different parts of Hama, inflicting major losses on the militants. The army men fended off terrorists’ attack on government force’ positions in al-Sat’hiyat region Southwest of the town of al-Salamiyah, killing or wounding a number of them and forcing the rest to retreat from the battlefield. The army’s artillery units also targeted militants’ gatherings and movements in al-Dalak and Eidoun flanks, killing a number of them and destroying their military equipment. The army aircraft meantime, carried out several combat flights over the gatherings and movements of ISIL in the village of Hamadi Omar, killing several terrorists and destroying at least seven military vehicles. The ISIL terrorists also came under air raid in the town of Aqayrabat and sustained major casualties. Within last 24 hours, truce agreements have been signed with representatives of 6 inhabited areas of the Latakia (2), Damascus (2), and Homs (2) provinces. The total number of inhabited areas, the leaders of which had signed reconciliation agreements, has reached 1032. Negotiations on joining ceasefire regime have been continued with field commanders of illegal armed groups in Muaddamiyet al-Shikh in the Damascus province, and detachments of armed opposition in the Homs, Hama, Aleppo, and al-Quneitra provinces. The number of ceasefire application forms signed with leaders of armed groupings remained 88. Within last 24 hours, 36 shellings performed by illegal armed formations have been registered in the provinces of Aleppo (19), Damascus (16), and al-Quneitra (1). In the Damascus province, armed formations of the Jaysh al-Islam grouping, which had claimed to be the opposition one, have fired mortars and small arms against Jaubar (twice), Kabun, and al-Qasa. Ahrar al-Sham armed formations have fired mortars against al-Sakhine quarter in the Aleppo city. Free Syrian Army armed formations have shelled Hai Saif al-Daula quarter in the Aleppo city. In the Aleppo province, terrorist groupings of Jabhat Fateh al-Sham (Jabhat al-Nusra) and ISIS have fired MLRS, mortars, antitank grenade launchers and small arms against Ansar inhabited area, Binyamin (twice), Leramon, Aqyul (twice), Karim Muhas, Tarba Lul, Tarik al-Bab, Dahiya al-Assad, Karim Katariji, and Ashrafiyah quarters, al-Assad military academy, area of the paperboard plant and gas factory, electricity station in Sheikh Said quarter, and Kastello trade center in the Aleppo city. In the Damascus province, terrorists have shelled Haush Harabu, Arbil (two times), Haush Nasri, Jaubar (three times), Bala al-Kadima (two times), Mazraad Mahmud, al-Wafidin camp and highway near Harasta. Terrorists have also shelled Hadar in the al-Quneitra province. – in the State Hospital in Masyaf in the Hama province – about 1 ton. Within last 24 hours, 302 civilians have left the blocked areas of the Eastern Aleppo under the auspices of the Russian Centre for reconciliation. More than 1,100 civilians have returned to their houses in the eastern areas of Aleppo, which had been liberated from insurgents. In accordance to the decision of the President of Syria, 10 insurgents, who had laid down their arms, have been granted amnesty. 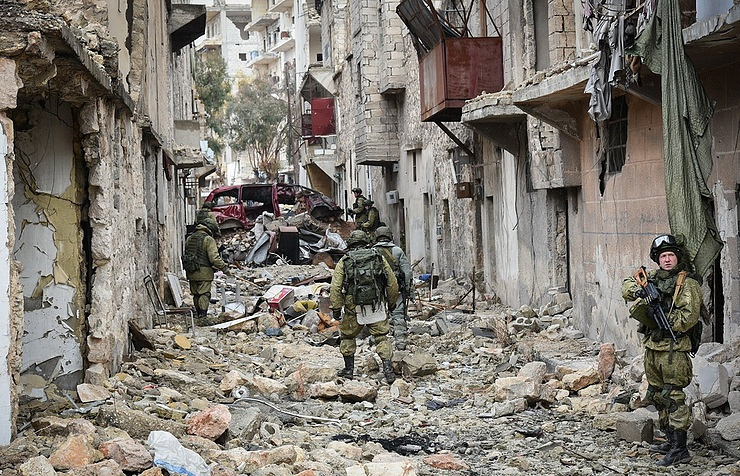 Russian Defense Ministry spokesman said on Tuesday that western countries are urging to impose sanctions against Russia after 80,000 civilians were liberated in Syria’s Aleppo. Major-General Igor Konashenkov said over the past 24 hours, the Syrian army had been able to liberate from militants almost half of Eastern Aleppo where 80,000 civilians reside, Al Masdar reported. “Now it turned out that the release of over 80,000 Aleppo residents held hostage by gunmen was not part of the plans of the UK and French Foreign Ministries, the US Department of State and the German Bundestag. They even urged to impose new sanctions for that,” the spokesman said. According to Konashenkov, there are tens of thousands of children in the liberated areas. 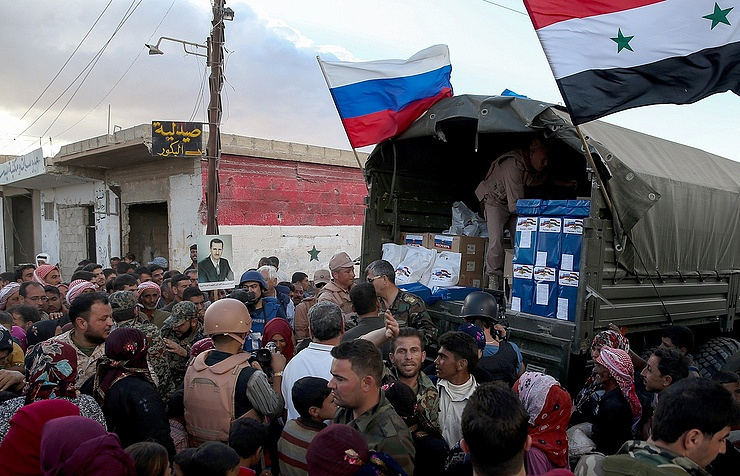 “Many of them were provided, for the first time in a long while, with food, drinking water and medical assistance in the humanitarian centers deployed by Russia. Over the past few years, these Syrians have been used as human shield by terrorists of every stripe and color in Aleppo. It was they who were allegedly protected by all Western politicians,” he said. Within last 24 hours, truce agreements have been signed with representatives of 4 inhabited areas of the Latakia (3) and al-Suwayda (1) provinces. The total number of inhabited areas, the leaders of which had signed reconciliation agreements, has reached 933. Negotiations on joining ceasefire regime have been continued with field commanders of armed groups in the Muaddamiyah al-Sham inhabited area in the Damascus province, and detachments of the armed opposition in the Homs, Aleppo, and al-Quneitra provinces. Within last 24 hours, 42 shellings performed by illegal armed formations have been registered in the provinces of Aleppo (17), Damascus (17), Latakia (5), Daraa (1) and Hama (2). Armed formation of the Jaysh al-Islam grouping, which had claimed to observe the ceasefire, has fired mortars and small arms against Jaubar, Blelije, Mazraat Mahmud, highway near Duma, and positions of the government troop near height 612 in the Damascus province. Ahrar al-Sham armed formation has fired mortars against Azizi in the Aleppo province. Moreover, Ahrar al-Sham formation has fired mortars, air defence systems and improvised MLRS against Quinsibba and Rasha in the Latakia province. This armed formation has also used an UAV fitted with an explosive device in Ain al-Qantara in the Latakia province. In the Damascus province, armed formations of terrorist groupings have fired improvised MLRS, mortars and small arms against Arbil, Haush Nasri and Harabu inhabited areas, Ibn al-Walid hospital and Kusair farm near Duma, electricity station and sports ground in Jaubar. Ansar inhabited area, Manyan, Dahiya al-Assad, 1070, Leramon, al-Maidam, Ashrafiyah, and al-Masharqa quarters of the Aleppo city, al-Assad military academy, Kastello trade center, Higma School, areas of the paperboard plant, and the SIRIATEL mobile communications station have been shelled in the Aleppo province. Terrorists have also shelled against Mardes and Suran (Hama province), Barza Tahtani (Latakia province), and Osman (Daraa province). Two humanitarian events have been held in the Aleppo city (Tishrin kindergarten and camp for refugees near al-Muhafaza), in course of which citizens had received about 4 tons of humanitarian aid (food products and items of first necessity).